Thanks to word-of-mouth, Freerice is a well-known and well-played game with over a million registered players. And, together, we have raised enough rice to feed millions of people. 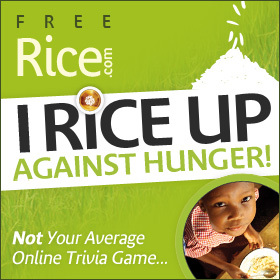 With over 2 billion people active online today, imagine what we could achieve if we all took time to "rice up" against hunger? Here are some fun tools to help you share us. Right click on this Avatar to save it to your own computer, and upload it to as your Facebook or Twitter profile picture, or on any of your social networks. Grab your banner to spread the word: Pick the size that's right for your site, highlight the banner's code, copy, choose area on your site to display the banner, and paste the code into the HTML version. 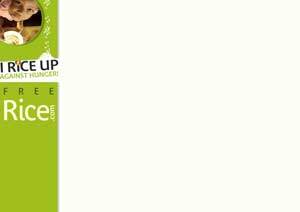 Print a poster or a customised flyer: Click on your choice, right click to save the image, print it. The flyers include blank space to add your own info! Get your students involved: We have many teachers and schools registered on Freerice. To find out how to register your class go to Freerice.com/teachers. If you create your own lesson plans or creative, please share it with us? Wear it on your sleeve: We have plenty of Freerice merch for you to choose from at the Freerice shop. Currently these items are priced as low as possible, and do not raise additional funds for meals. Please feel free to submit designs for us to include in the shop? 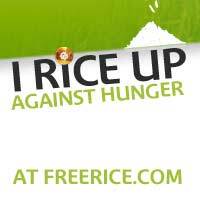 Thank you for helping us to raise much needed rice! Together we stand a chance of ending hunger worldwide.